Liverpudlian promoter Charlie 'Mac' McBain held regular skiffle and rock events at his venues. On Friday 18 October he ran one such event, at the New Clubmoor Hall in Norris Green, Liverpool. 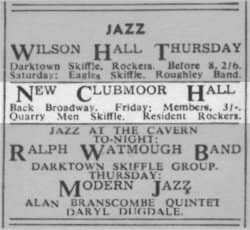 It was the first show in which Paul McCartney appeared onstage with the Quarrymen. McCartney played lead guitar. First-night nerves, however, caused him to make a hash of his solo during the Quarrymen's version of Arthur Smith's 1946 instrumental hit Guitar Boogie. For my first gig, I was given a guitar solo on Guitar Boogie. I could play it easily in rehearsal so they elected that I should do it as my solo. Things were going fine, but when the moment came in the performance I got sticky fingers; I thought, 'What am I doing here?' I was just too frightened; it was too big a moment with everyone looking at the guitar player. I couldn't do it. That's why George was brought in. McCartney's debut with the Quarrymen was a significant occasion in the development of the group. For the promoter, however, they made little solid impression. Charlie Mac's recorded verdict on the group was a scribbled "Good & Bad" on the Quarrymen's visiting card. Ah! Poor Paul. That happens to me sometimes. A great and historic day for both Paul and especially George. I think this was at the Wilson hall Garston,Charlie Baines the manager had booked them and it was where Paul first sang his song dedicated to his mother Mary called ‘Iv,e lost my girl’,i was there at the time. It’s unlikely that he had written that song yet (maybe a few months after) and The Quarry Men never played self-written songs because they thought their songwriting was not good enough. Paul wrote ‘I Lost My Little Girl’ when he was 14, so it was definitely before this time. He’d already (at least partially) written some other songs too. Whether they were performed is a different matter. I don’t think ‘I Lost My Little Girl’ was ever performed before he dusted it off for the MTV Unplugged performance.